On Sunday night at Manila’s international airport, Maria Ressa, the CEO and executive editor of digital news outlet Rappler, thanked reporters for showing up to cover the event. She had just returned from Washington, D.C., and New York, where she received the Knight International Journalism Award and the Gwen Ifill Press Freedom Award. Under Ressa’s watch, Rappler has probed the extrajudicial killings committed in Duterte’s war on drugs. “I surrendered to the court this morning, went through the process of what a criminal would go through, and filed bail without surrendering my right to question the Pasig court’s jurisdiction over this tax case,” she said. Authorities have conducted other investigations into the outlet and Ressa’s work. In January, the Securities and Exchange Commission temporarily revoked Rappler’s license for supposedly violating a law that prohibits foreign majority ownership of businesses in the Philippines. 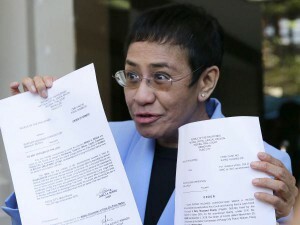 The Philippine Department of Justice also began investigating Ressa for alleged cyber libel. Ressa, a former CNN bureau chief, described the tax charges as “a clear case of harassment,” adding that agents had been deployed to Rappler’s office. According to Rappler, Ressa’s arraignment is scheduled for Friday morning. The charges triggered condemnation from human rights organisations. Rappler launched in 2012, gaining praise for its 2017 “Impunity” series, which investigated killings in Duterte’s drug sweep, and a series about propaganda, which examined how social media was exploited after Duterte was elected president. As his plans to eradicate drugs unfolded, Rappler’s staff were among the government’s first targets in 2016, Ressa told NPR this spring. “You can say I was blindsided by the fact that the government has used authoritarian tactics to try to control the narrativethe public narrative and to use a propaganda machine in a completely new way,” she said. In November, the impunity of officials in Duterte’s drug war appeared to lapse: three police officers were found guilty of murdering a 17-year-old the first convictions in Duterte’s anti-drug campaign, NPR’s Emily Sullivan reported.